The framers of the U.S. Constitution designed a system that helps insulate federal judges from political pressure. Federal judges are appointed and can only be removed by impeachment. Congress cannot even reduce their salaries. This gives judges the freedom to protect individual rights, even when their decisions might be unpopular with voters or politicians. In the Federalist Papers, Alexander Hamilton argued that if judges were not free to strike down laws that violate the Constitution, then “all the reservations of particular rights or privileges would amount to nothing.” Judicial independence is crucial to the Constitution’s separation of powers. Most state judges are elected, however, and state legislatures are much more likely to lash out at courts that strike down laws as unconstitutional. Legislators can try to change who sits on the courts by expanding or contracting the number of judges on courts, and they can give themselves more power over choosing judges. In the past year alone, the North Carolina General Assembly has tried all of these things. Legislators considered a plan to add seats to (i.e. “pack”) the state Supreme Court after their preferred candidate did not win in the 2016 election. They passed a law to shrink the Court of Appeals to prevent Gov. Roy Cooper from filling upcoming vacancies. Several pending bills would take away the governor’s authority to appoint certain judges and give that power to the legislature. These power grabs and others have been tracked and publicized by N.C. Voters for Clean Elections, NC Policy Watch and the Brennan Center for Justice. Now, Rep. Justin Burr is proposing a judicial gerrymandering bill that one legislative aide said was intended to elect more Republican judges. While sitting judges are limited in what they can speak out about, several retired Republican judges have spoken out against these attacks on the independence of North Carolina’s courts. Judge Douglas McCullough resigned his seat on the Court of Appeals to protest the bill to shrink the court, a move that allowed Gov. Cooper to appoint his replacement before the new law took effect. Retired Justice Bob Orr has criticized the General Assembly’s efforts to change the courts, and he has said that litigation over the 2011 redistricting is motivating legislators. The North Carolina Supreme Court, however, upheld the redistricting maps for the state legislature in 2014. Even after the U.S. Supreme Court ordered it to take another look at the maps, the state Supreme Court upheld the maps again in 2015. But the 2016 election saw a new progressive majority emerge on the North Carolina Supreme Court, prompting the Republican-controlled legislature to hatch a scheme to add two seats to the court and have the lame-duck Republican Gov. Pat McCrory fill the seats. The newly constituted state Supreme Court will soon reconsider the 2011 redistricting maps. 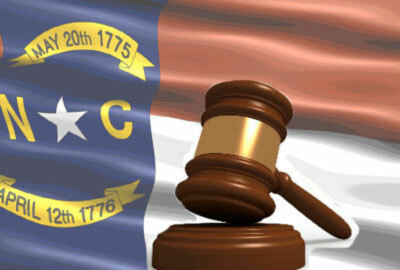 While the court-packing plan was not enacted, the General Assembly has continued its attack on judicial independence. The judicial gerrymandering bill, House Bill 717 is the latest effort to place the General Assembly’s preferred judges on the bench. An alternative bill, House Bill 124 would allow time to study the shape of judicial districts and get input from all stakeholders before redrawing the maps. Rep. Burr was criticized for trying to rush the maps through with only 48-hours notice and for not including input from judges and other stakeholders. The criticism prompted Rep. Burr to tour parts of the state asking judges and other stakeholders about his proposal. Rep. Marcia Morey, a former judge, pointed out in a judicial redistricting committee meeting that the judges she has talked to have been uniformly opposed to the new districts. Critics have held hearings in some of the places that would be impacted, and voters have criticized the attacks on the courts. Legislators have also gotten an earful from voters at recent hearings about legislative gerrymandering. The bottom line: North Carolina voters are fed up with gerrymandering, the power grabs over the courts, and the endless lawsuits that result from both of them. The General Assembly should stop putting partisan politics above the Constitution and the law and let the courts do their job. Melissa Price Kromm is the Director of North Carolina Voters for Clean Elections.